This ocean world theme children's amusement playground is popular in children and their parents, this is a suitable for indoor or outdoor amusement area, area is median size, the general can be placed in the center of the playground, the amusement area contains rich entertainment equipment - Tunnel Ladder, Rainbow bridge, Swings, Slides, Trampolines, Climbing, Toy-like Weapons, Ball Pools, Sand Pit, Kiddy Cars, Newest Electronic Toys, etc., can satisfy 3-15 years old children climbed, jump, run, throw activities requirements. And this area can satisfy many children with activities also does not appear crowded, children can invite partners play together, increase the kid's interaction and communication skills for children to provide more fun. Children stay in this polychrome world, their curiosity and exploring desire will be well satisfied and their abilities of cognition, judgment and problem-solving will be developed completely . 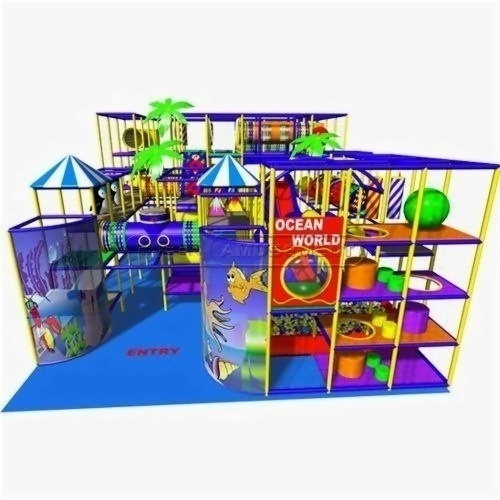 We are an exporter including Indoor playground.we can send good service for all of our customers all the world!We also accept special order about the products. If you are interested in our products. Please do not hesitate to let us know.We are pleased to give you the detailed information.We produce are of very good quality, and we promise good after-sale service for all our customersWe are sincerely looking for your cooperation.